Ever since I discovered “00” flour, I’ve been smitten with the way it produces a perfectly soft and silky dough every single time I use it. So when I came across this fabulous pizza dough recipe that called for “00” flour, I knew I wanted to try it, and decided I’d use it make calzones. After I kneaded the dough, I placed it on top of one of our radiators for about an hour, which allowed it to double in size perfectly. And these taste fabulous: the rich vegan cheese and sausage kind of melt into the other components here during the baking time, and slicing into it reveals an amazing array of flavors and textures. I was surprised at how easy these were to make, and how close they tasted to the calzones I used to order many years ago at restaurants. Although I used leftover homemade vegan sausage and cheese to stuff these, prepared Field Roast sausage and Daiya or Follow Your Heart cheese would work nicely here as well. Place a pizza stone into the oven on the lowest rack. Allow to preheat at 500 while you prepare the other ingredients and roll out the dough. Heat a teaspoon of olive oil over medium low heat in a saute pan. Add in the shallots and allow to soften, about 3 minutes. Remove from the heat and place into a small bowl. Add a little more oil to the pan and add in the mushrooms. Allow to soften for 6-8 minutes, then add in the garlic and saute for about a minute more. Transfer to another small bowl. If needed, re-oil the pan and add in the sausages. Saute until slightly browned, about 2-3 minutes on each side. Remove from the heat and allow to cool. Separate the dough into flour equal pieces. On a floured surface, roll them out to form circles with a 8- to 10-inch diameter. They don’t need to be perfect. 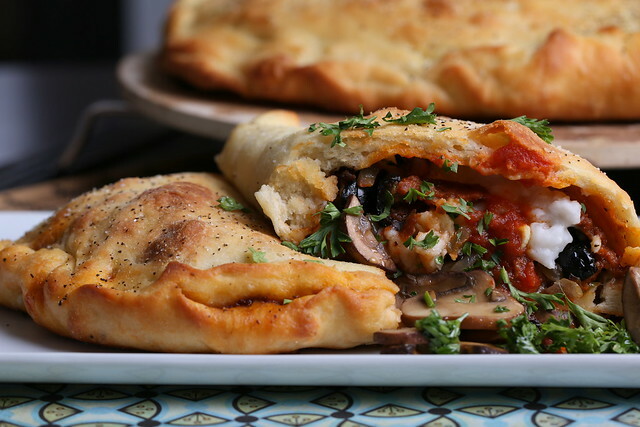 Fill one side of each of the calzones with all of the components. Fold the dough over the top, and pinch the sides together to form a seal. Once the pizza stone has preheated at 500 for about 30 minutes, place the calzones on it (I did two separate batches). Brush with a generous amount of olive oil, then sprinkle with salt and pepper. Bake for about 15 minutes, checking the bottoms to ensure they do not burn. Remove from the oven and allow to cool for a few minutes, then serve. Thanks for posting this recipe! 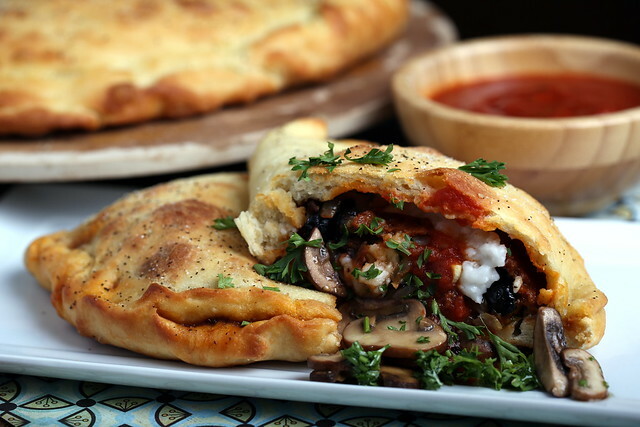 I'm always a little intimidated by calzones, but this makes it seem fairly easy! holy moly, these look just amazing!!! I used to make calzones all the time, but it's been years. What a great idea. Thanks for sharing your recipe! These look amazing! I have been wanting some, but have been too lazy, lol! This looks like a winner! "Vegan food that doesn't look like vegan food," as my teenage son would say! And hearty! Wowee, these look perfectly delicious! made these last week. one of the best dishes i've ever made. thank you! awesome — so glad you enjoyed Joshua! Hi David, that sounds great — thanks for sharing! And I love your products! Amateur, here: I was hoping to use this recipe to make mini calzones (so, maybe 1/3 of the size indicated here). How will this affect the cooking time and temp, if at all? I've never tried that, so I can't say for sure, but I think you could keep the temp as indicated above, just reduce bake time a bit to prevent burning. Good luck!